"MOBA" redirects here. For other uses, see Moba (disambiguation). Typical map of a MOBA genre game. Yellow lines are the "lanes" where action is focused; blue and red dots are the defensive "towers/turrets" that defend them; light-colored quarter circles are the teams' bases; and blue and red corners are the structures whose destruction claims victory. Multiplayer online battle arena (MOBA), also known as action real-time strategy (ARTS), is a subgenre of strategy video games that originated as a subgenre of real-time strategy, in which a player controls a single character in a team who compete versus another team of players. Often the objective is to destroy the opposing team's main structure with the assistance of periodically-spawned computer-controlled units that march forward along set paths; MOBA games can have other goals, like defeating every player on the enemy team. Player characters typically have abilities that improve over the course of a game and that contribute to a team's overall strategy. MOBAs are a fusion of action games, role-playing games and real-time strategy games, though MOBA players usually do not construct buildings or units and there is examples of MOBA games that cannot be considered RTS at all (Smite, Paragon). The first widely-accepted game in the genre was Aeon of Strife (AoS), a custom map for StarCraft in which four players each control a single powerful unit and, aided by weak computer-controlled units, compete against a stronger computer. Defense of the Ancients (DotA), a map based on Aeon of Strife for Warcraft III: Reign of Chaos and The Frozen Throne, was one of the first major titles of its genre and the first MOBA for which sponsored tournaments have been held. It was followed by the two spiritual successors, League of Legends and Heroes of Newerth, and eventually a sequel, Dota 2, as well as numerous other games in the genre such as Heroes of the Storm and Smite. The roots of the genre can be traced back decades to one of the earliest real-time strategy titles, the 1989 Sega Mega Drive/Genesis game Herzog Zwei. It has been cited as a precursor to, or an early example of, the MOBA genre. It used a similar formula, where each player controls a single command unit in one of two opposing sides on a battlefield.. Herzog Zwei's influence is also apparent in several later MOBA games such as Guilty Gear 2: Overture (2007) and AirMech (2012). In 1998, Future Cop: LAPD featured a strategic Precinct Assault mode similar to Herzog Zwei, in which the players could actively fight alongside generated non-player units.. The PC version also allowed for online competitive play, technically making Future Cop: LAPD the first MOBA game ever released as, unlike Herzog Zwei, it meets the criteria of an online battle arena. Also in 1998, computer game company Blizzard Entertainment released its best-selling real-time strategy game (RTS) StarCraft with a suite of game editing tools called StarEdit. The tools allowed members of the public to design and create custom maps that allowed play that was different from the normal maps. A modder known as Aeon64 made a custom map named Aeon of Strife (AoS) that became popular. Aeon64 stated that he was attempting to create gameplay similar to that of Future Cop: LAPD's Precinct Assault mode. In the Aeon of Strife map, players controlled a single powerful hero unit fighting amidst three lanes, though terrain outside these lanes was nearly vacant. By 2008, the popularity of DotA had attracted commercial attention. That year, The Casual Collective released Minions, a Flash web game.Gas Powered Games also released the first stand-alone commercial title in the genre, Demigod. In late 2009, Riot Games' debut title, League of Legends initially designed by Feak, was released. Riot began to refer to the game's genre as a multiplayer online battle arena (MOBA). Also in 2009, IceFrog, who had continued to develop DotA: Allstars, was hired by Valve Corporation, in order to design a sequel to the original map. There are two opposing teams whose goal collectively as a team is generally to destroy their enemy's base to win, though some games have the option of different victory conditions. Each team most typically consists of five players. Typically, there is one main structure which must be destroyed to win; destroying other structures within the opposing team's base may confer other benefits. Defensive structures, which are usually automatic "turrets", are in place to prevent this, as well as relatively weak computer-controlled units which periodically spawn at each base and travel down predefined paths toward the opposing team's base called "[[minion ]]s". 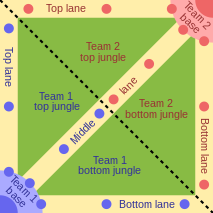 There are typically 3 "lanes" that are the main ways of getting from one base to another; in between the lanes is an uncharted area called the "jungle." A player controls a single powerful in-game unit generally called a 'hero'. When a hero stands near a killed enemy unit or kills an enemy unit, they gain experience points and gold which allow the hero to level up and buy items at a store. When a hero levels up, they have the ability to strengthen their abilities, of which they typically have four of. When a hero dies, they have to wait a designated time, which generally increases as it levels up until it revives at the team's base. Heroes typically fall into one of several roles, such as tanking, damage-dealing, or healing & support. Each individual hero is unique, with its own abilities that it does not share with any other character, even those which share its role(s). Also typically, there is a large starting pool of heroes; League of Legends, for instance, began with 40, and has added at least one new one every month for its entire lifespan, reaching 100 in 2012. This adds to the learning curve of the game, as players must not only learn the game's goals and strategies but also find at least one hero they excel at playing, not to mention familiarize themselves with the remaining roster. Additionally, each hero is deliberately limited in the roles they can fulfill. No one hero is ever (supposed to be) powerful enough to win the game without support from their team. This creates a strong emphasis on teamwork and cooperation. Each player typically receives a small amount of gold per second during the course of the game. Moderate amounts of gold are rewarded for killing hostile computer-controlled units and larger amounts are rewarded for killing enemy heroes. Gold is used by heroes to buy a variety of different items that range in price and impact. For the most part, this involves improving the combat viability of the hero, although there may be other items that support the hero or team as a whole in different ways. As the heroes of each team get stronger, they can use multiple strategies to gain an advantage. These strategies can include securing objectives, killing enemy heroes and farming gold by killing A.I. units. The stronger a team gets, the more capable they are at destroying the enemy team and their base. Members of the genre do not generally feature several other elements traditionally found in real-time strategy games, notably base management, and army building. Some video games have certain heroes which control a few specialized units. The MOBA genre has more resemblance with role-playing games (RPG) in gameplay, though the MOBA genre focuses on multiplayer battle in an arena while RPG typically revolve around a single player story. In most MOBAs, players assume specific roles such as Tank, Marksman, Mage, Fighter, and Support. Most , if not each champion/hero can be played as carry, support and ganker; the number and type can differ depending on the game. The carry role is expected to scale and itemize themselves to do the most damage against enemy characters and objectives, but may also require protection and assistance from their team members. Supports are characters who support the entire team, they have abilities that are meant to aid allies and disable or slightly harm enemies. Some supports have healing abilities which can be very useful in fights, giving health to an ally while the enemy is losing more and more of theirs. Ganker roles are flexible, as they have both carry and support skills that are used to disrupt and eliminate enemies, thus giving their teammates an advantage over their opponents. According to Nuangjumnong Gavrilova, gankers can "act as a strategist, decision-maker or supporter depending on the team's needs." Player roles can also be classified by the particular lane they are focusing on, such as "top laner", "mid laner", and "bottom laner". Due to the large volume of MOBA matches played on a daily basis globally, (League of Legends alone had a reported 100 million active monthly players worldwide in 2016 and an average of 27 million League of Legends games played per day reported in 2014), MOBA has become a platform to apply big data tools to predict match outcomes based on in-game factors such as hero kill/death/assist ratios, gold earned, time of a match, synergy with other players, team composition, and other parameters. The prospects of using Artificial Intelligence to play in matches and predict match outcome represents the future of having robots interacting with humans in competitive gaming environments. ^ a b c "Frequently Asked Questions". GetDota.com. Archived from the original on 11 November 2010. ^ John Funk (2 September 2013). "MOBA, DOTA, ARTS: A brief introduction to gaming's biggest, most impenetrable genre". Polygon. Archived from the original on 22 December 2015. Retrieved 23 December 2015. ^ a b c "History of DotA". Gosugamers.net. Archived from the original on 12 September 2013. Retrieved 8 September 2013. ^ a b Brown, Fraser (15 January 2013). "Like Macross without the drama". Archived from the original on 19 January 2013. Retrieved 19 January 2013. ^ "Review: Guilty Gear 2: Overture (Microsoft Xbox 360) - Diehard GameFAN". diehardgamefan.com. Archived from the original on 31 December 2014. ^ "Future Cop: LAPD". IGN. 14 December 1998. Archived from the original on 24 December 2015. Retrieved 23 December 2015. ^ "Future Cop L.A.P.D. Review". Gamerevolution.com. 1 September 1998. Archived from the original on 24 December 2015. Retrieved 23 December 2015. ^ "Future Cop: LAPD". Play Old PC Games. 23 May 2014. Retrieved 17 January 2019. ^ Dean, Paul (16 August 2011). "The Story of DOTA". Eurogamer. Gamer Network. Archived from the original on 8 November 2016. Retrieved 6 April 2014. ^ a b c Dimirti (22 July 2013). "Dota 2: A History Lesson". The Mittani. Archived from the original on 11 December 2013. Retrieved 24 August 2013. ^ Nguyen, Thierry (1 September 2009). "Clash of The DOTAs". 1UP.com. Archived from the original on 24 January 2012. Retrieved 21 October 2009. ^ Psychotronic (30 November 2008). "Minions". jayisgames.com. Archived from the original on 7 November 2012. Retrieved 7 November 2012. ^ Lopez, Miguel (21 February 2008). "Demigod". Gamespy.com. Archived from the original on 25 August 2012. Retrieved 20 November 2010. ^ Nemikan (21 September 2009). "DOTA reborn: Three games inspired by the legendary WC3 mod". Icrontic.com. Archived from the original on 25 August 2012. Retrieved 17 November 2010. ^ Perez, Daniel (16 January 2009). "League of Legends Interview". 1UP.com. Archived from the original on 24 January 2012. Retrieved 19 October 2010. ^ Arirang (3 October 2009). "A Look at the Future of Dota and the AoS Genre". GameRiot.com. Archived from the original on 25 August 2012. Retrieved 19 October 2010. ^ a b Nutt, Christian (29 August 2011). "The Valve Way: Gabe Newell And Erik Johnson Speak". Archived from the original on 25 August 2012. Retrieved 24 August 2013. ^ Jackson, Leah (23 December 2010). "Looking Back at 2010: The Year in PC Games". g4tv.com. Archived from the original on 25 August 2012. Retrieved 24 December 2010. ^ Wedel, Mark (24 June 2010). "Kalamazoo-made 'Heroes of Newerth' drawing huge online gaming crowd". Kalamazoo Gazette. Archived from the original on 28 June 2010. ^ "Valve Announces Dota 2". Valve Corporation. 19 October 2010. Archived from the original on 15 October 2010. ^ Totillo, Stephen (13 October 2010). "Valve's New Game Is Dota 2". Kotaku. Archived from the original on 25 August 2012. Retrieved 17 October 2010. ^ Josh Augustine (17 August 2010). "Riot Games' dev counter-files "DotA" trademark". PC Gamer. Archived from the original on 3 February 2013. Retrieved 23 December 2015. ^ "All-New Blizzard Custom Maps Featured at Blizzcon 2010". Blizzard Entertainment. 22 October 2010. Archived from the original on 25 October 2010. ^ Augustine, Josh (23 October 2010). "The first heroes in SC2's DOTA map". PCGamer. Archived from the original on 24 October 2010. ^ Reilly, Jim (11 May 2012). "Valve, Blizzard Reach DOTA Trademark Agreement". Game Informer. Archived from the original on 24 July 2012. ^ Bramblet, Matthew (1 August 2013). "Diablo III Announcement Coming at Gamescon – Activision Blizzard Q2 2013 earnings report details the Blizzard All-Star progress and 'Project Titan' revamp". Diablo Somepage. Archived from the original on 9 August 2013. Retrieved 19 October 2013. ^ "Heroes of the Storm". Blizzard Entertainment. Archived from the original on 21 October 2013. Retrieved 21 October 2013. ^ "MOBA Title SMITE Has A Release Date, Coming This March". ^ "Blizzard's Worlds Collide When Heroes of the Dorm Launches June 2 - Everyone's invited to join the battle for the Nexus when open beta testing begins on May 19". 20 April 2015. Archived from the original on 23 April 2015. Retrieved 20 April 2015. ^ "Blizzard explains why it doesn't call Heroes of the Storm a MOBA". GameSpot. 9 November 2013. Archived from the original on 16 November 2013. Retrieved 15 November 2013. ^ "Heroes of Newerth – Charge!". Dedoimedo.com. Archived from the original on 7 December 2010. ^ "The Crystal Scar | League of Legends". Dominion.leagueoflegends.com. Archived from the original on 8 July 2014. Retrieved 23 December 2015. ^ Leahy, Brian (13 October 2010). "Dota Explained and How You Can Play it Now". Shacknews.com. Archived from the original on 15 November 2010. ^ "Basic Survival – Learn Dota". PlayDota.com. Archived from the original on 25 August 2012. Retrieved 28 October 2010. ^ Augustine, Rob (3 July 2012). "Introducing League of Legends' 100th champion: Jayce, the Defender of Tomorrow". Archived from the original on 9 November 2016. ^ Biessener, Adam (13 October 2010). "Valve's New Game Announced, Detailed: Dota 2". Game Informer. Archived from the original on 16 October 2010. ^ a b c d e Gavrilova, Nuangjumnong (22 January 2016). "The Effects of Gameplay on Leadership Behaviors: An Empirical Study on Leadership Behaviors and Roles in Multiplayer Online Battle Arena Games". Transactions on Computational Science XXVI: Special Issue on Cyberworlds and Cybersecurity. Springer. p. 147. ISBN 9783662492475. ^ Ng, Patrick; Nesbitt, Keith; Blackmore, Karen (5 February 2015). Sound Improves Player Performance in a Multiplayer Online Battle Arena Game. Artificial Life and Computational Intelligence. Lecture Notes in Computer Science. Springer, Cham. pp. 166–174. doi:10.1007/978-3-319-14803-8_13. ISBN 9783319148021. ^ "Can 5v5 Transform Vainglory into a Major Player in Esports? - Dexerto.com – Esports & Gaming". dexerto.com. Archived from the original on 2 March 2018. Retrieved 3 May 2018. ^ "Number of players of selected eSports games worldwide as of August 2017 (in million)". Rift Herald. 13 September 2016. Retrieved 12 August 2018. ^ Sheer, Ian (January 27, 2014). "Player Tally for 'League of Legends' Surges". Wsj.com. Archived from the original on January 30, 2014. Retrieved January 31, 2014. ^ Hodge, Victoria; Devlin, Sam; Sephton, Nick; Block, Florian; Drachen, Anders; Cowling, Peter (17 November 2017). "Win Prediction in Esports: Mixed-Rank Match Prediction in Multi-player Online Battle Arena Games". arXiv:1711.06498 [cs.AI]. ^ "LoL Tier List". 17 November 2017. Retrieved 19 December 2018. ^ "OPENAI'S DOTA 2 DEFEAT IS STILL A WIN FOR ARTIFICIAL INTELLIGENCE". 28 August 2018. Retrieved 19 December 2018.